I can’t help falling in love with the Cascade House! 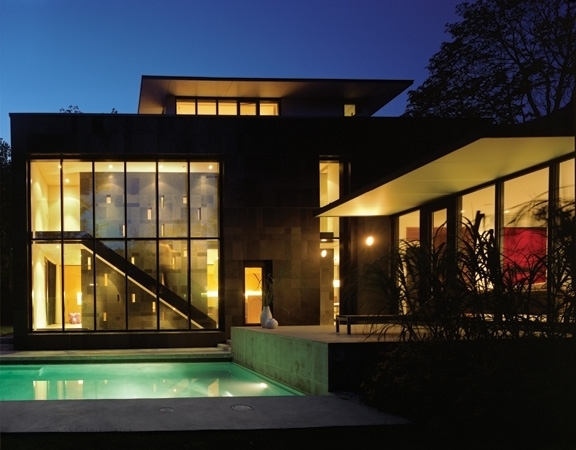 The Cascade House in Toronto, by Paul Raff Studio, is one of Toronto’s most beautiful, contemporary homes. Located in a neighbourhood called Forest Hill, the Cascade House, constructed in 2009, is the epitome of imaginative design with its use of natural materials and environmental-friendly design features. Its most striking, and arguably definitive design element, is the emerald wall of stacked glass, a sculptural privacy screen, set directly in the house’s front façade. From both inside the living room and outside on street level, Cascade House lives up to its name, as the stacked glass sculptural privacy screen gives a textured look that resembles a waterfall cascading down the exterior. There are over 400 ¾ inch glass panels stacked vertically in a crenellated pattern to offer privacy and a “passively kinetic” experience, that Raff likens to being behind a cascading waterfall. The piece offers a softened, gently fractured view that plays with light and echoes the serenity of the neighborhood. While Canadian winters can be particularly chilly, a large internal slate wall captures available solar energy to warm Cascade House during winter evening hours. Smaller apertures within the wall dapple adjacent rooms with light. Resonating within the house, the slate wall frames views and guides movement. This isn't the only eco-friendly feature. In an article for Azure magazine, John Bentley Mays describes some of the Cascade homes other eco-friendly design features, such as a ‘high-performance building envelope, precisely calibrated and oriented to the changing angles of the sun’ as well, as an ultra-high-efficient boiler and radiant in-floor heating. The Cascade house in a fantastic example of how environmentally-conscious design can elevate our aesthetic while better serving the environment. Check out some more amazing works by Paul Raff Studio. For more information on the Cascade house’s eco-friendly features, and a beautifully poetic read, read John Bentley Mays article for Azure Magazine called Green Light. Researched and Written by Gorana Tolja, Graduate of the Ryerson School of Interior Design & a MA Student at OCAD University in the Contemporary Art, Design and New Media Histories program, focusing on contemporary design history.